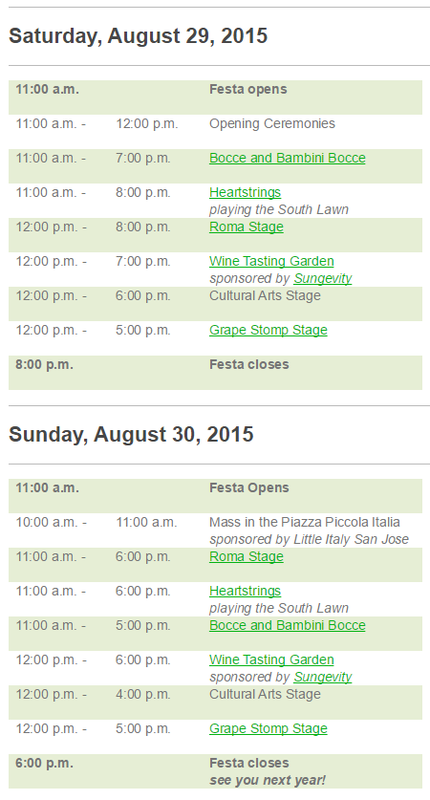 The San Jose Blog: The Italian Family Festa is This Weekend! The 35th annual Italian Family Festa is coming to Little Italy San Jose this Saturday and Sunday. There will be free entertainment, a grape stomp, bocce ball, wine tasting, arts & crafts, and of course tons a great Italian food. Last year I remember the fried zuchinni, meatball sandwiches, and eggplant pesto sandwiches being fantastic. The event runs from 11am to 8pm on Saturday (August 29th) and 11am to 6pm on Sunday (August 30th). 35,000 people are expected to attend and seating is limited, so bring a lawn chair if you plan on staying for a while. You can see the full schedule below. Head over to the Italian Family Festa website for more info and details. You know what, I take that back. Will do at least a quick plug right now.